Do you feel the need… the need for a thoroughly uninspiring game that demands an enormous amount of time with very little reward? Then Need For Speed: Payback is right up your proverbial alley! If however you want a consistently rewarding and gorgeous-looking game which has a staggering amount of top-quality content, go buy Forza Horizon 3 instead. 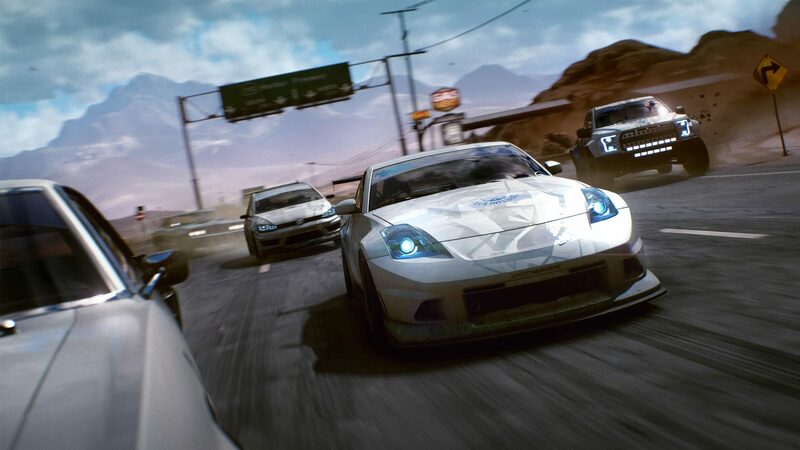 The FH3 recommendation has been very specifically chosen; not only because it’s one of this generation’s best games, but also because the Horizon series has clearly influenced the latest NFS quite significantly. As in Horizon, races (and, as is the case here, story missions) are not chosen from a list in a menu. The starting points are marked on the map, and you need to drive up to the relevant spot before you can hit a button to start it. As well as missions to progress the crappy story, there are a multitude of challenges such as jumps, speed traps, and whatnot to earn stars in. Aside from our distress at the lack of a cockpit view, there’s nothing to complain about at the most fundamental of levels. Cars are split into various disciplines (racing, drifting, offroad, drag, offensive), with noticeable differences between them. The drift cars are satisfyingly weighted for example, ideal for throwing around corners without being frustratingly difficult to keep under control. Handling in general is purposefully unrealistic, opening the door for as many people as possible. It’s not as good as it should be but, hey, at least it’s not broken. It would probably be even worse if you had to use this camera angle. There’s a lot of content around. No matter where you are on the map, you’re never far away from a race or an activity. 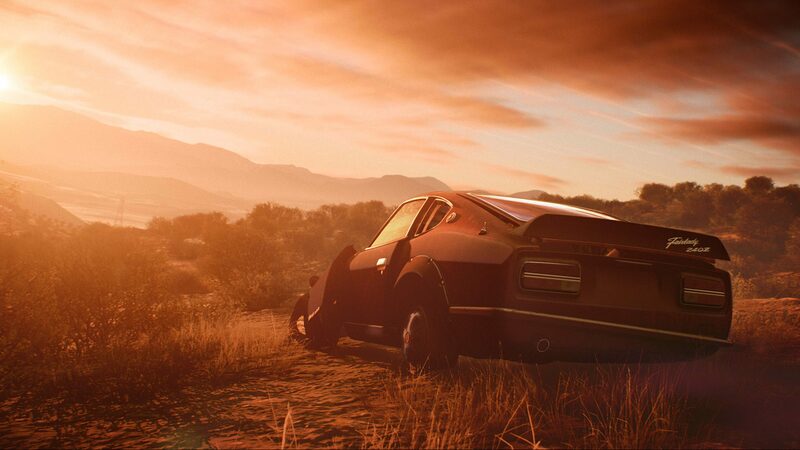 The map’s also peppered with Burnout/Horizon-style billboards to break through, which tend to be more challenging to reach than you might expect. Presuming you’re playing with an internet collection (and that you have at least one person on your friends list who also plays the game), there’s also always a time/score of a friend to beat. We have to admit, it’s difficult to resist the lure of smashing a friend’s records. The world itself however is… okay. It does the job, and nothing more. This is partly due to the so-so graphics, but also largely due to the feeling that we’ve driven around cities and environments like this a hundred times before. There’s no style of race or event that can’t be had in a superior game, with the closest thing to a unique hook – ramming police cars or other opponents to oblivion in certain missions – lacking any real sense of excitement. The main problems with the latest Need For Speed stem from money-spinning ideas. A minor, but noticeable, one is product placement. If done well, it can even benefit a game. Indeed, the racing genre tends to be the one with the most advertising – particularly licensed motorsports – as zooming around a track plastered with ads is, if nothing else, authentic. Here however, you’ll drive around for ages without seeing a single ad (or perhaps the occasional fictional one) and then, all of a sudden, there’s a truck or billboard incongruously screaming COCA COLA! BRAUN! CASTROL! Or something at you. It’s quite funny, really. Maybe he fell asleep at the wheel playing the game? Would it shock you to learn that the other, bigger, problem in this EA-published game is related to loot boxes? They’re masquerading under the name “shipments”, but we’ll stick with “loot boxes”. Earned through play or bought with real-world money, they contain a combination of cosmetic items and in-game currencies. Again, you can earn the contents through play, but this is a predictably grind-heavy process if you want your cars to remain competitive without denting your bank account. Upgrading your machines has a noticeable effect, which is good; but upgrading is done through a card system, which is bad. Each race has an associated recommended car level; and if you don’t meet it, you have very little chance of winning (and you must win in order to complete the event). You’re on a constant quest for the best stat-enhancing cards, which artificially (and significantly) lengthens the godawful story. Even worse (oh yes, there’s worse), this problem infects online play. There are temporary hire cars available, but they’re rubbish. You bring the same cars you use offline to the online modes, meaning that anybody that’s spent dozens of hours grinding – or, of course, anybody that’s splashed lots of cash on credits and loot boxes – has a quite frankly unfair advantage over those that haven’t. It’s not quite pay-to-win, but it’s much closer than any game should ever have reached. While it’s not a complete disaster, there’s no way we can recommend Need For Speed: Payback when there are so, so many superior racers more worthy of your money. With a few tweaks but without the deeply flawed card system, this could have been quite good; but this isn’t the universe where that game exists.